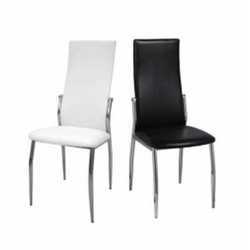 Fancy, sturdy, comfortable and modern eco-leather chairs (white, black, red) at the best value for money. Suitable for home, kitchen, living room, office, waiting room, conference room, bar, restaurant, pub, pizzeria, ice cream parlour, bakery, shop, hotel, disco. Chrome-plated steel frame and legs.